Return of George Irvin’s popular traditional funfair at Queen Elizabeth Olympic Park in Stratford, close to Stratford Station and in site of the magnificent Olympic Stadium. With all your favourite rides and great value for money, this is a not to be missed occasion. 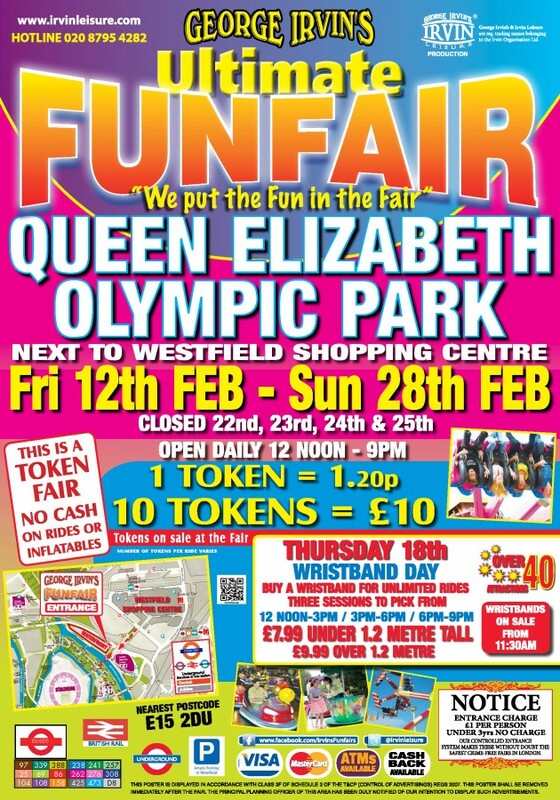 Every day you can buy tokens at just £ 1.20 each or ten for a tenner as this is a token fair, but on Thursday 18th Feb and Thursday 25th Feb we have a super wristband day where you can buy wristbands for just £ 7.99 if under 1.2 metres, £9.99 for 1.2 metres and over, and go on all the rides for the session of your choice. Sessions are 1-4, 4-7 and 7-10 with wristbands on sale from 12.30pm so get there before the start of your chosen session and get the maximum value from this never to be repeated (until next year) offer! NOTICE: Entrance charge of £1 per person. No charge for under 3yrs. No cash on rides or inflatables – token fair only. Look out for the posters!